For all its familiarity in elementary school textbooks, this is still a moving bit of history painting. There’s something missing, though, in that clearing sky: the pigeons. as remarkable a bird as any in America. They are in vast numbers in all parts, and have been of great service at particular times to our garrisons, in supplying them with fresh meat, especially at the out-posts. A friend told me, that in the year in which Quebec was taken, the whole army was supplied with them, if they chose it. every man took his club … each person could kill as many as he wanted. been at Niagara when the centinel has given the word that the Pigeons were flying; and the whole garrison were ready to run over one another, so eager were they to get fresh meat. 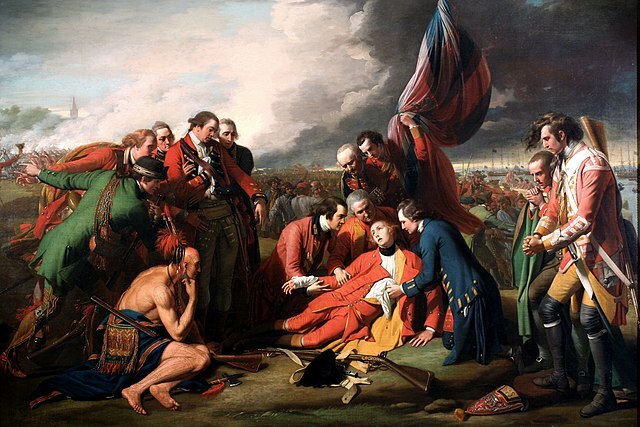 Surely to bold General Wolfe and his men goes the credit for the victory at Québec. 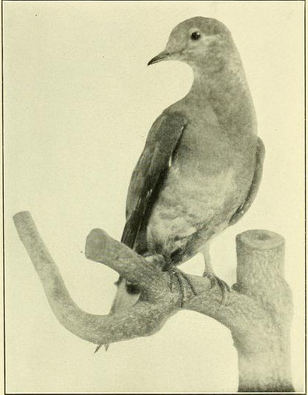 But the Passenger Pigeon, too, played an important role. If not for some well-timed flights of that species, they might still be speaking French in eastern Canada. On August 31, 1914, the world was still inhabited by a living passenger pigeon. Two days later, all we had left were the slightly tacky ornaments of still-Victorian parlors. Barnes, of course, wasn’t calling Reinecke a fool; they were friends, or at least oological colleagues, and neither ever believed that his own activities as a “scientific” amateur had contributed to the end of the pigeon. Indeed, one of the most striking phenomena around the extinction of this species is the blithe hypocrisy of the collectors of the day. 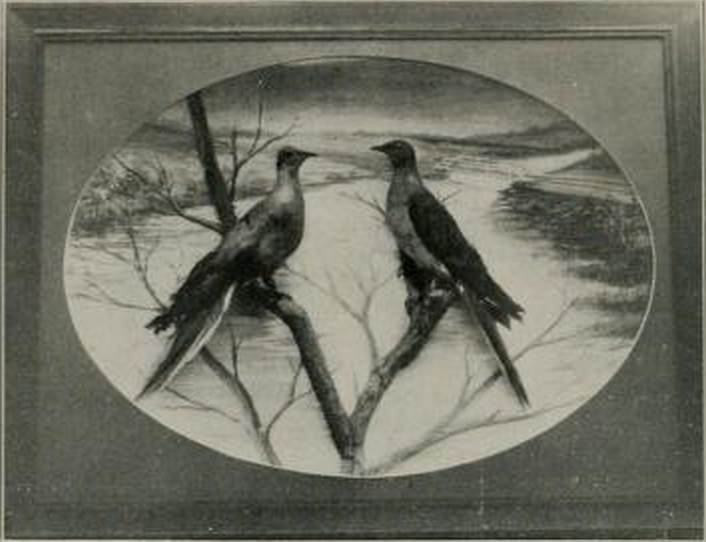 Reinecke, characteristically, blamed the “ruthless extirpation” on netting and the “professional plundering of nests.” Barnes’s reproach of his fellow citizens was posted in the window of his law office in Chicago — accompanied by one of the mounts from his extensive private collection. It’s true: No museum collector and no private amateur ever took anything like the numbers of pigeons slaughtered by the farm boys and the pothunters. But their crocodile tears in the months after September 1914 are still unseemly at best. The passenger pigeons have their own unique way of plucking acorns: they climb continuously up and down the oak trees; they ascend one after another, and each beats its wings two or three times to knock off then descends to eat its own or those that the others have knocked down. The activity of ascent and descent creates a perpetual motion. And one we’ll never see again. If that title made my readers, all two of them, look twice — Good. Individuals die; the grand word extinction can be properly applied only to the passing from existence of species and other populations. But at the same time, of course, that passing from existence can take place only with the death of the last individual of the species. And on today’s anniversary, the one hundredth September 1 we have seen come without the passenger pigeon, birders are recalling both: the extinction of that once wildly abundant species and the sordid death of its last member, the zoo bird Martha. The indelible image in everyone’s mind is of Martha all tidied up, her skin stuffed and mounted and (once again) on display in Washington. We’ve seen a lot of that specimen 223979 the past few days, but there are other pictures of Martha, grainy, slightly grisly pictures that perhaps drive home the finality of extinction — for her and for her species — better than any glass-cased relic could. When Martha dropped on September 1, 1914, her corpse was frozen into a great block of ice for shipment to the Smithsonian. 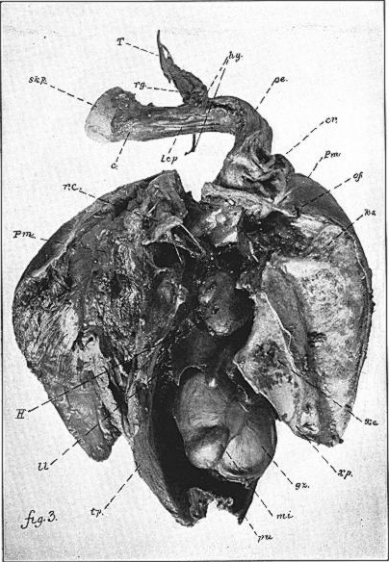 The package arrived on September 4, and Charles Richmond immediately telephoned Robert Shufeldt, the anatomist and pioneering photographer (etc.). 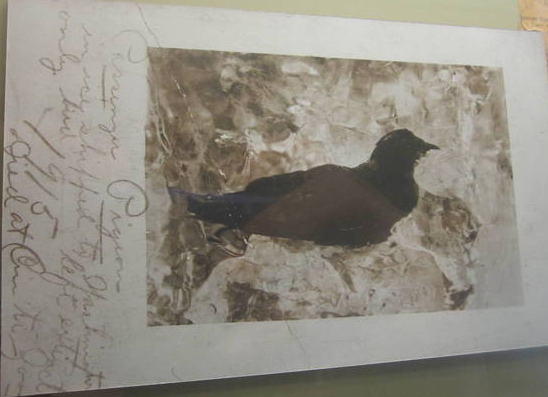 Around 11:00 that morning, the bird had sufficiently thawed for Shufeldt to take three photographs of it in the flesh. Shufeldt, Martha, and the museum preparator William Palmer then — who would have expected this? — left the Smithsonian for Shufeldt’s house on 18th Street; how they transported the still intact corpse I do not know. 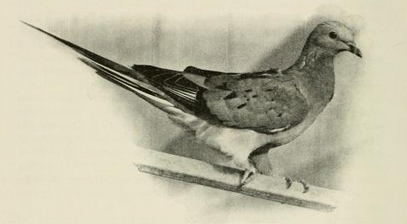 Shortly after 1:15 pm, in a back room on the third floor, Palmer began to skin the last of the passenger pigeons. 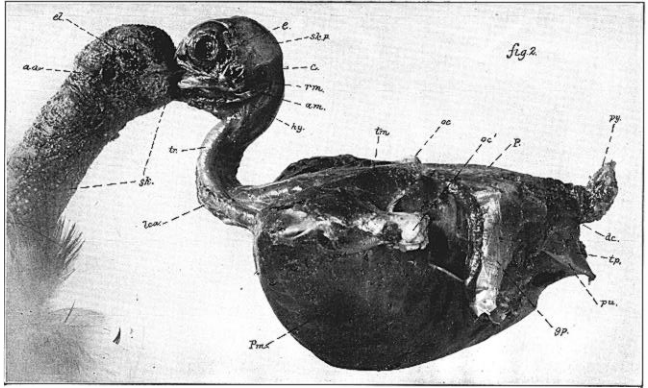 Immediately after Shufeldt took this photograph, showing the skin still attached to the carcass at the front of the skull, he placed the eyes and brain in alcohol, and Palmer finished removing Martha’s skin. The two men then went downstairs for a late lunch. As 4:00 approached, Palmer went home “with the skin in his possession,” and Shufeldt ascended the stairs to deal with the body. Were I to go as far as I could into this subject of the anatomy of the Passenger Pigeon, my collected observations would afford material for several good-sized volumes. preferring to preserve it in its entirety — perhaps somewhat influenced by sentimental reasons, as the heart of the last “Blue Pigeon” that the world will ever see alive. The skin would eventually be mounted by the Smithsonian taxidermist Nelson Wood. Neat and pretty, isn’t she? A lot neater, a lot prettier, than extinction — or than her own death, a hundred years ago today. 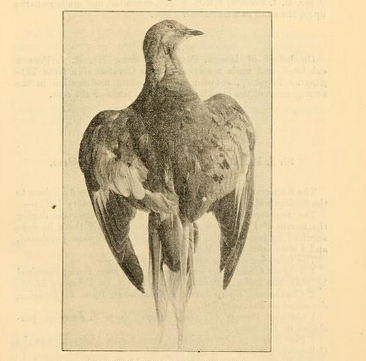 One of those Michigan pigeons of 1889.
to-day extinct, so far as anyone has been able to discover, although less than fifteen years ago it was abundant on this continent and to the people of this State was as familiar as sparrows now are. One day in 1889 these birds were apparently as numerous as they had ever been within the memory of man. The next day they had disappeared, and no one has seen or heard positively anything of them since. more pigeons in the woods when the colony abandoned them than when the birds came in. This remarkable fact was noticeable invariably at all pigeon roosts, so that the theory that the wild pigeon has become extinct, like the buffalo, through ruthless slaughter, will not hold. There was no online “Comments” section back then, but Mott’s animadversions struck a chord with some of his readers. 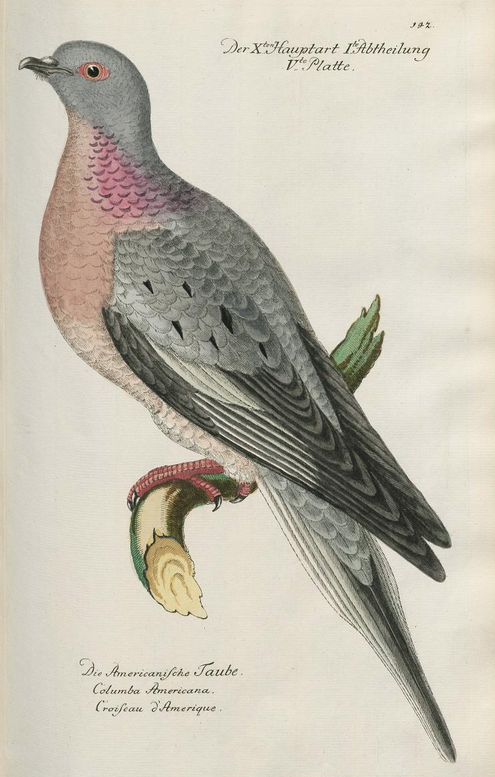 One wrote from The Bahamas with encouraging news of “large flocks of wild pigeons coming from the West,” which “darkened the air in their flights” — familiar words, those — and provided both locals and visitors from the mainland with “much sport.” Could these be, Mott’s correspondent wondered, “the American wild pigeon … who has sought for his Winter sojourn more remote and sparsely settled lands”? Such hearsay and speculation were trumped a week later, when Robert Barbour of Montclair, New Jersey, reported his own sighting of two passenger pigeons in Caldwell in September 1900. Barbour wrote to Frank Chapman at the American Museum about his sighting, but received no reply. Today, a hundred years after certainty was attained, we’d react differently.